Okay...I promise I will not sing to you, but it is beginning to look a lot like Christmas. I got out my Christmas tree yesterday, put it up, pulled out the lights and had to throw away almost 3 strands of lights.....so I have a few lights on the bottom, and I have all the ornaments on it....but I still need to finish off with more lights. I do not have a picture of mine....but I do have a picture of Paige's....her roommate, Bizzle, only likes real trees....so they got a real tree and got it all decorated.....Antonio was sooooooo super excited! Can you see the excitement in his face? I just love this time of year!! Remember the Rock, Paper, Scissors, Lizard, Spock Yarn I got last week? 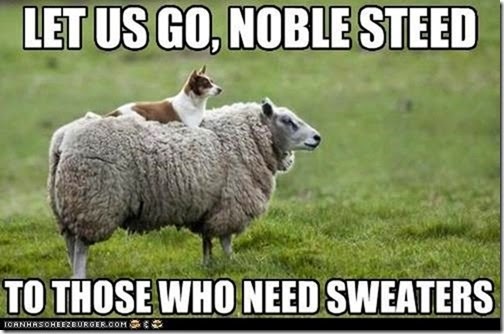 It was an awesome early Christmas present from my BFF Darlene......well, I loved the yarn and colorway so much......I FINISHED THE SOCKS! Yup...with all the UFO's I need to get working on, I made a pair of socks....but I love them, and they are for ME!!!!!!!!!!!! Paige's friend had her baby early, so I finished the last hat.....now she has small, medium, and large to choose from. My sister recently returned from Europe and brought me some European crack (at least to me) from my relatives....Thank you Tante Mecki, Uncle Dieter, and Cousins Sabine and Dagmar! This is the best chap stick in the world....Labello.....and the best candy in the world....MaoaM!!! I also worked on Little Mario's baby's blanket....I am just about at the 1/2 way point! I worked on Paige's sweater too, but only about 5-6 rows (hey, they are over 300 stitches each).....and I also had a Club Delivery today....it is Miss Babs Knitting Tour Final Destination of 2014.....this is Isadora Yarn (A heavy lace with 70% merino wool and 30% tussah silk) and the pattern is by Joji Locatelli.....I love this designer and have several of her designs in my que. It is called "A Day to Remember" The closeup of the yarn is the best coloring I can capture. There are lots of extras (as always with Miss Babs Tour)....the band around the yarn is a leather bracelet that says "Must Knit Faster" by CJohannesen Studio. Today was also the day to buy next year's tour.....and I got mine! I am also participating in a Secret Santa Exchange and my package went out to the recipient today! I hope she likes it....I cannot wait to get mine! While I was shopping for my Secret Santa Sister, I came across some wax warmers.....let me tell you, I have tons of candle wax (scentsy)....and it seems my holders to melt them ( also scentsy) are always breaking. Plus, I have a lot of the plug in the wall (like a night light) and the grand kids think all those are too interesting, so I have to go with ones I put up high on a shelf and then a cord plugs in to warm up the wax.....well, I found the cutest Knit Cable Pattern ones....whatcha' think? I have not decided if I am going to gift them to others, or keep for myself (they were initially bought to keep for me). Lastly, the lady that heads up all the HiyaHiya stuff asked me to make a video of her grandma's stretchy bind off......so I did. This is for a toe up sock and it is for a k1, p1 ribbing.....I used it on my Rock, Paper, Scissors, Lizard, Spock socks....and it is stretchy! 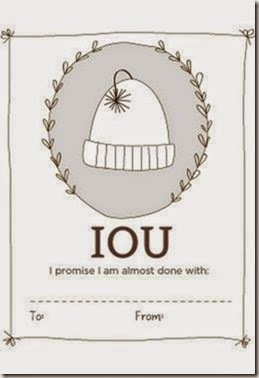 That is all I have.......oh, one more thing....a friend of mine on LSSK found these cute IOU labels.....so just in case you are a little behind on your Christmas knitting but still want to wrap something and put it under the tree......print this out, fill it out, put it in a box and wrap it!